This article is about ethno-cultural Tibet. For the administrative region, see Tibet Autonomous Region. For other uses, see Tibet (disambiguation). Tibet (/tɪˈbɛt/ ( listen); Tibetan: བོད་, Lhasa dialect IPA: /pʰøː˨˧˩/; Chinese: 西藏; pinyin: Xīzàng) is a historical region covering much of the Tibetan Plateau in Inner Asia. It is the traditional homeland of the Tibetan people as well as some other ethnic groups such as Monpa, Tamang, Qiang, Sherpa, and Lhoba peoples and is now also inhabited by considerable numbers of Han Chinese and Hui people. Tibet is the highest region on Earth, with an average elevation of 5,000 metres (16,000 ft). The highest elevation in Tibet is Mount Everest, Earth's highest mountain, rising 8,848 m (29,029 ft) above sea level. The Tibetan Empire emerged in the 7th century, but with the fall of the empire the region soon divided into a variety of territories. The bulk of western and central Tibet (Ü-Tsang) was often at least nominally unified under a series of Tibetan governments in Lhasa, Shigatse, or nearby locations; these governments were at various times under Mongol and Chinese overlordship. Thus Tibet remained a suzerainty of the Mongol and later Chinese rulers in Nanjing and Beijing, with reasonable autonomy given to the Tibetan leaders. The eastern regions of Kham and Amdo often maintained a more decentralized indigenous political structure, being divided among a number of small principalities and tribal groups, while also often falling more directly under Chinese rule after the Battle of Chamdo; most of this area was eventually incorporated into the Chinese provinces of Sichuan and Qinghai. The current borders of Tibet were generally established in the 18th century. Following the Xinhai Revolution against the Qing dynasty in 1912, Qing soldiers were disarmed and escorted out of Tibet Area (Ü-Tsang). The region subsequently declared its independence in 1913 without recognition by the subsequent Chinese Republican government. Later, Lhasa took control of the western part of Xikang, China. The region maintained its autonomy until 1951 when, following the Battle of Chamdo, Tibet became incorporated into the People's Republic of China, and the previous Tibetan government was abolished in 1959 after a failed uprising. Today, China governs western and central Tibet as the Tibet Autonomous Region while the eastern areas are now mostly ethnic autonomous prefectures within Sichuan, Qinghai and other neighbouring provinces. There are tensions regarding Tibet's political status and dissident groups that are active in exile. Tibetan activists in Tibet have reportedly been arrested or tortured. The Tibetan name for their land, Bod བོད་, means "Tibet" or "Tibetan Plateau", although it originally meant the central region around Lhasa, now known in Tibetan as Ü. The Standard Tibetan pronunciation of Bod, [pʰøʔ˨˧˨], is transcribed Bhö in Tournadre Phonetic Transcription, Bö in the THL Simplified Phonetic Transcription and Poi in Tibetan pinyin. Some scholars believe the first written reference to Bod "Tibet" was the ancient Bautai people recorded in the Egyptian Greek works Periplus of the Erythraean Sea (1st century CE) and Geographia (Ptolemy, 2nd century CE), itself from the Sanskrit form Bhauṭṭa of the Indian geographical tradition. The modern Standard Chinese exonym for the ethnic Tibetan region is Zangqu (Chinese: 藏区; pinyin: Zàngqū), which derives by metonymy from the Tsang region around Shigatse plus the addition of a Chinese suffix, 区 qū, which means "area, district, region, ward". 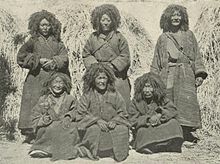 Tibetan people, language, and culture, regardless of where they are from, are referred to as Zang (Chinese: 藏; pinyin: Zàng) although the geographical term Xīzàng is often limited to the Tibet Autonomous Region. The term Xīzàng was coined during the Qing dynasty in the reign of the Jiaqing Emperor (1796–1820) through the addition of a prefix meaning "west" (西 xī) to Zang. The best-known medieval Chinese name for Tibet is Tubo (Chinese: 吐蕃 also written as 土蕃 or 土番; pinyin: Tǔbō or Tǔfān). This name first appears in Chinese characters as 土番 in the 7th century (Li Tai) and as 吐蕃 in the 10th-century (Old Book of Tang describing 608–609 emissaries from Tibetan King Namri Songtsen to Emperor Yang of Sui). In the Middle Chinese spoken during that period, as reconstructed by William H. Baxter, 土番 was pronounced thux-phjon and 吐蕃 was pronounced thux-pjon (with the x representing tone). Other pre-modern Chinese names for Tibet include Wusiguo (Chinese: 烏斯國; pinyin: Wūsīguó; cf. Tibetan dbus, Ü, [wyʔ˨˧˨]), Wusizang (Chinese: 烏斯藏; pinyin: wūsīzàng, cf. Tibetan dbus-gtsang, Ü-Tsang), Tubote (Chinese: 圖伯特; pinyin: Túbótè), and Tanggute (Chinese: 唐古忒; pinyin: Tánggǔtè, cf. Tangut). American Tibetologist Elliot Sperling has argued in favor of a recent tendency by some authors writing in Chinese to revive the term Tubote (simplified Chinese: 图伯特; traditional Chinese: 圖伯特; pinyin: Túbótè) for modern use in place of Xizang, on the grounds that Tubote more clearly includes the entire Tibetan plateau rather than simply the Tibet Autonomous Region. The English word Tibet or Thibet dates back to the 18th century. Historical linguists generally agree that "Tibet" names in European languages are loanwords from Semitic Ṭībat orTūbātt (طيبة، توبات) (טובּה, טובּת), itself deriving from Turkic Töbäd, literally: "The Heights" (plural of töbän). From the perspective of historical linguistics, Tibetan most closely resembles Burmese among the major languages of Asia. Grouping these two together with other apparently related languages spoken in the Himalayan lands, as well as in the highlands of Southeast Asia and the Sino-Tibetan frontier regions, linguists have generally concluded that there exists a Tibeto-Burman family of languages. More controversial is the theory that the Tibeto-Burman family is itself part of a larger language family, called Sino-Tibetan, and that through it Tibetan and Burmese are distant cousins of Chinese. The language has numerous regional dialects which are generally not mutually intelligible. It is employed throughout the Tibetan plateau and Bhutan and is also spoken in parts of Nepal and northern India, such as Sikkim. In general, the dialects of central Tibet (including Lhasa), Kham, Amdo and some smaller nearby areas are considered Tibetan dialects. Other forms, particularly Dzongkha, Sikkimese, Sherpa, and Ladakhi, are considered by their speakers, largely for political reasons, to be separate languages. However, if the latter group of Tibetan-type languages are included in the calculation, then 'greater Tibetan' is spoken by approximately 6 million people across the Tibetan Plateau. Tibetan is also spoken by approximately 150,000 exile speakers who have fled from modern-day Tibet to India and other countries. Although spoken Tibetan varies according to the region, the written language, based on Classical Tibetan, is consistent throughout. This is probably due to the long-standing influence of the Tibetan empire, whose rule embraced (and extended at times far beyond) the present Tibetan linguistic area, which runs from northern Pakistan in the west to Yunnan and Sichuan in the east, and from north of Qinghai Lake south as far as Bhutan. The Tibetan language has its own script which it shares with Ladakhi and Dzongkha, and which is derived from the ancient Indian Brāhmī script. Starting in 2001, the local deaf sign languages of Tibet were standardized, and Tibetan Sign Language is now being promoted across the country. The first Tibetan-English dictionary and grammar book was written by Alexander Csoma de Kőrös in 1834. 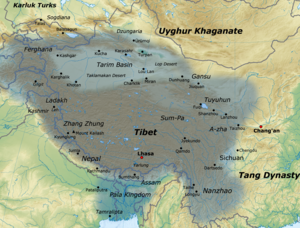 Humans inhabited the Tibetan Plateau at least 21,000 years ago. This population was largely replaced around 3,000 BP by Neolithic immigrants from northern China, but there is a partial genetic continuity between the Paleolithic inhabitants and contemporary Tibetan populations. The earliest Tibetan historical texts identify the Zhang Zhung culture as a people who migrated from the Amdo region into what is now the region of Guge in western Tibet. Zhang Zhung is considered to be the original home of the Bön religion. By the 1st century BCE, a neighboring kingdom arose in the Yarlung valley, and the Yarlung king, Drigum Tsenpo, attempted to remove the influence of the Zhang Zhung by expelling the Zhang's Bön priests from Yarlung. He was assassinated and Zhang Zhung continued its dominance of the region until it was annexed by Songtsen Gampo in the 7th century. Prior to Songtsen Gampo, the kings of Tibet were more mythological than factual, and there is insufficient evidence of their existence. The history of a unified Tibet begins with the rule of Songtsen Gampo (604–650 CE), who united parts of the Yarlung River Valley and founded the Tibetan Empire. He also brought in many reforms, and Tibetan power spread rapidly, creating a large and powerful empire. It is traditionally considered that his first wife was the Princess of Nepal, Bhrikuti, and that she played a great role in the establishment of Buddhism in Tibet. In 640 he married Princess Wencheng, the niece of the powerful Chinese emperor Taizong of Tang China. Under the next few Tibetan kings, Buddhism became established as the state religion and Tibetan power increased even further over large areas of Central Asia, while major inroads were made into Chinese territory, even reaching the Tang's capital Chang'an (modern Xi'an) in late 763. However, the Tibetan occupation of Chang'an only lasted for fifteen days, after which they were defeated by Tang and its ally, the Turkic Uyghur Khaganate. The Kingdom of Nanzhao (in Yunnan and neighbouring regions) remained under Tibetan control from 750 to 794, when they turned on their Tibetan overlords and helped the Chinese inflict a serious defeat on the Tibetans. In 747, the hold of Tibet was loosened by the campaign of general Gao Xianzhi, who tried to re-open the direct communications between Central Asia and Kashmir. By 750, the Tibetans had lost almost all of their central Asian possessions to the Chinese. However, after Gao Xianzhi's defeat by the Arabs and Qarluqs at the Battle of Talas (751) and the subsequent civil war known as the An Lushan Rebellion (755), Chinese influence decreased rapidly and Tibetan influence resumed. At its height in the 780's to 790's the Tibetan Empire reached its highest glory when it ruled and controlled a territory stretching from modern day Afghanistan, Bangladesh, Bhutan, Burma, China, India, Nepal, Pakistan, Kazakhstan, Kyrgyzstan, Tajikistan. In 821/822 CE Tibet and China signed a peace treaty. A bilingual account of this treaty, including details of the borders between the two countries, is inscribed on a stone pillar which stands outside the Jokhang temple in Lhasa. Tibet continued as a Central Asian empire until the mid-9th century, when a civil war over succession led to the collapse of imperial Tibet. The period that followed is known traditionally as the Era of Fragmentation, when political control over Tibet became divided between regional warlords and tribes with no dominant centralized authority. An Islamic invasion from Bengal took place in 1206. The Mongol Yuan dynasty, through the Bureau of Buddhist and Tibetan Affairs, or Xuanzheng Yuan, ruled Tibet through a top-level administrative department. One of the department's purposes was to select a dpon-chen ('great administrator'), usually appointed by the lama and confirmed by the Mongol emperor in Beijing. The Sakya lama retained a degree of autonomy, acting as the political authority of the region, while the dpon-chen held administrative and military power. Mongol rule of Tibet remained separate from the main provinces of China, but the region existed under the administration of the Yuan dynasty. If the Sakya lama ever came into conflict with the dpon-chen, the dpon-chen had the authority to send Chinese troops into the region. Tibet retained nominal power over religious and regional political affairs, while the Mongols managed a structural and administrative rule over the region, reinforced by the rare military intervention. This existed as a "diarchic structure" under the Yuan emperor, with power primarily in favor of the Mongols. Mongolian prince Khuden gained temporal power in Tibet in the 1240s and sponsored Sakya Pandita, whose seat became the capital of Tibet. Drogön Chögyal Phagpa, Sakya Pandita's nephew became Imperial Preceptor of Kublai Khan, founder of the Yuan dynasty. Yuan control over the region ended with the Ming overthrow of the Yuan and Tai Situ Changchub Gyaltsen's revolt against the Mongols. Following the uprising, Tai Situ Changchub Gyaltsen founded the Phagmodrupa Dynasty, and sought to reduce Yuan influences over Tibetan culture and politics. Between 1346 and 1354, Tai Situ Changchub Gyaltsen toppled the Sakya and founded the Phagmodrupa Dynasty. The following 80 years saw the founding of the Gelug school (also known as Yellow Hats) by the disciples of Je Tsongkhapa, and the founding of the important Ganden, Drepung and Sera monasteries near Lhasa. However, internal strife within the dynasty and the strong localism of the various fiefs and political-religious factions led to a long series of internal conflicts. The minister family Rinpungpa, based in Tsang (West Central Tibet), dominated politics after 1435. In 1565 they were overthrown by the Tsangpa Dynasty of Shigatse which expanded its power in different directions of Tibet in the following decades and favoured the Karma Kagyu sect. In 1578, Altan Khan of the Tümed Mongols gave Sonam Gyatso, a high lama of the Gelugpa school, the name Dalai Lama, Dalai being the Mongolian translation of the Tibetan name Gyatso "Ocean". The 5th Dalai Lama is known for unifying the Tibetan heartland under the control of the Gelug school of Tibetan Buddhism, after defeating the rival Kagyu and Jonang sects and the secular ruler, the Tsangpa prince, in a prolonged civil war. His efforts were successful in part because of aid from Güshi Khan, the Oirat leader of the Khoshut Khanate. With Güshi Khan as a largely uninvolved overlord, the 5th Dalai Lama and his intimates established a civil administration which is referred to by historians as the Lhasa state. This Tibetan regime or government is also referred to as the Ganden Phodrang. Qing dynasty rule in Tibet began with their 1720 expedition to the country when they expelled the invading Dzungars. Amdo came under Qing control in 1724, and eastern Kham was incorporated into neighbouring Chinese provinces in 1728. Meanwhile, the Qing government sent resident commissioners called Ambans to Lhasa. In 1750 the Ambans and the majority of the Han Chinese and Manchus living in Lhasa were killed in a riot, and Qing troops arrived quickly and suppressed the rebels in the next year. Like the preceding Yuan dynasty, the Manchus of the Qing dynasty exerted military and administrative control of the region, while granting it a degree of political autonomy. The Qing commander publicly executed a number of supporters of the rebels and, as in 1723 and 1728, made changes in the political structure and drew up a formal organization plan. The Qing now restored the Dalai Lama as ruler, leading the governing council called Kashag, but elevated the role of Ambans to include more direct involvement in Tibetan internal affairs. At the same time the Qing took steps to counterbalance the power of the aristocracy by adding officials recruited from the clergy to key posts. For several decades, peace reigned in Tibet, but in 1792 the Qing Qianlong Emperor sent a large Chinese army into Tibet to push the invading Nepalese out. This prompted yet another Qing reorganization of the Tibetan government, this time through a written plan called the "Twenty-Nine Regulations for Better Government in Tibet". Qing military garrisons staffed with Qing troops were now also established near the Nepalese border. 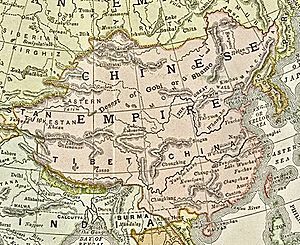 Tibet was dominated by the Manchus in various stages in the 18th century, and the years immediately following the 1792 regulations were the peak of the Qing imperial commissioners' authority; but there was no attempt to make Tibet a Chinese province. In 1834 the Sikh Empire invaded and annexed Ladakh, a culturally Tibetan region that was an independent kingdom at the time. Seven years later a Sikh army led by General Zorawar Singh invaded western Tibet from Ladakh, starting the Sino-Sikh War. A Qing-Tibetan army repelled the invaders but was in turn defeated when it chased the Sikhs into Ladakh. The war ended with the signing of the Treaty of Chushul between the Chinese and Sikh empires. Putuo Zongcheng Temple, a Buddhist temple complex built between 1767 and 1771. The temple was modeled after the Potala Palace. As the Qing dynasty weakened, its authority over Tibet also gradually declined, and by the mid-19th century its influence was minuscule. Qing authority over Tibet had become more symbolic than real by the late 19th century, although in the 1860s the Tibetans still chose for reasons of their own to emphasize the empire's symbolic authority and make it seem substantial. This period also saw some contacts with Jesuits and Capuchins from Europe, and in 1774 a Scottish nobleman, George Bogle, came to Shigatse to investigate prospects of trade for the British East India Company. However, in the 19th century the situation of foreigners in Tibet grew more tenuous. The British Empire was encroaching from northern India into the Himalayas, the Emirate of Afghanistan and the Russian Empire were expanding into Central Asia and each power became suspicious of the others' intentions in Tibet. In 1904, a British expedition to Tibet, spurred in part by a fear that Russia was extending its power into Tibet as part of The Great Game, invaded the country, hoping that negotiations with the 13th Dalai Lama would be more effective than with Chinese representatives. When the British-led invasion reached Tibet on December 12, 1903, an armed confrontation with the ethnic Tibetans resulted in the Massacre of Chumik Shenko, which resulted in 600 fatalities amongst the Tibetan forces, compared to only 12 on the British side. Afterwards, in 1904 Francis Younghusband imposed a treaty known as the Treaty of Lhasa, which was subsequently repudiated and was succeeded by a 1906 treaty signed between Britain and China. In 1910, the Qing government sent a military expedition of its own under Zhao Erfeng to establish direct Manchu-Chinese rule and, in an imperial edict, deposed the Dalai Lama, who fled to British India. Zhao Erfeng defeated the Tibetan military conclusively and expelled the Dalai Lama's forces from the province. His actions were unpopular, and there was much animosity against him for his mistreatment of civilians and disregard for local culture. Emerging with control over most of mainland China after the Chinese Civil War, the People's Republic of China incorporated Tibet in 1950 and negotiated the Seventeen Point Agreement with the newly enthroned 14th Dalai Lama's government, affirming the People's Republic of China's sovereignty but granting the area autonomy. Subsequently, on his journey into exile, the 14th Dalai Lama completely repudiated the agreement, which he has repeated on many occasions. The Chinese used the Dalai Lama to be able to have control of the military's training and actions. The Dalai Lama had a strong following as many people from Tibet looked at him as their leader from not just a political point of view but, also from a spiritual perspective. After the Dalai Lama's government fled to Dharamsala, India, during the 1959 Tibetan Rebellion, it established a rival government-in-exile. Afterwards, the Central People's Government in Beijing renounced the agreement and began implementation of the halted social and political reforms. During the Great Leap Forward, between 200,000 and 1,000,000 Tibetans died, and approximately 6,000 monasteries were destroyed during the Cultural Revolution, thus the vast majority of historic Tibetan architecture was destroyed. In 1962 China and India fought a brief war over the disputed South Tibet and Aksai Chin regions. Although China won the war, Chinese troops withdrew north of the McMahon Line, effectively ceding South Tibet to India. In 1980, General Secretary and reformist Hu Yaobang visited Tibet and ushered in a period of social, political, and economic liberalization. At the end of the decade, however, before the Tiananmen Square protests of 1989, monks in the Drepung and Sera monasteries started protesting for independence, and so the government halted reforms and started an anti-separatist campaign. Human rights organisations have been critical of the Beijing and Lhasa governments' approach to human rights in the region when cracking down on separatist convulsions that have occurred around monasteries and cities, most recently in the 2008 Tibetan unrest. All of modern China, including Tibet, is considered a part of East Asia. Historically, some European sources also considered parts of Tibet to lie in Central Asia. Tibet is west of the Central China plain, and within mainland China, Tibet is regarded as part of 西部 (Xībù), a term usually translated by Chinese media as "the Western section", meaning "Western China". Tibet has some of the world's tallest mountains, with several of them making the top ten list. Mount Everest, located on the border with Nepal, is, at 8,848 metres (29,029 ft), the highest mountain on earth. Several major rivers have their source in the Tibetan Plateau (mostly in present-day Qinghai Province). These include the Yangtze, Yellow River, Indus River, Mekong, Ganges, Salween and the Yarlung Tsangpo River (Brahmaputra River). The Yarlung Tsangpo Grand Canyon, along the Yarlung Tsangpo River, is among the deepest and longest canyons in the world. Tibet has been called the "Water Tower" of Asia, and China is investing heavily in water projects in Tibet. The Indus and Brahmaputra rivers originate from a lake (Tib: Tso Mapham) in Western Tibet, near Mount Kailash. The mountain is a holy pilgrimage site for both Hindus and Tibetans. The Hindus consider the mountain to be the abode of Lord Shiva. The Tibetan name for Mt. Kailash is Khang Rinpoche. Tibet has numerous high-altitude lakes referred to in Tibetan as tso or co. These include Qinghai Lake, Lake Manasarovar, Namtso, Pangong Tso, Yamdrok Lake, Siling Co, Lhamo La-tso, Lumajangdong Co, Lake Puma Yumco, Lake Paiku, Como Chamling, Lake Rakshastal, Dagze Co and Dong Co. The Qinghai Lake (Koko Nor) is the largest lake in the People's Republic of China. The atmosphere is severely dry nine months of the year, and average annual snowfall is only 18 inches (46 cm), due to the rain shadow effect. Western passes receive small amounts of fresh snow each year but remain traversible all year round. Low temperatures are prevalent throughout these western regions, where bleak desolation is unrelieved by any vegetation bigger than a low bush, and where wind sweeps unchecked across vast expanses of arid plain. The Indian monsoon exerts some influence on eastern Tibet. Northern Tibet is subject to high temperatures in the summer and intense cold in the winter. Cultural Tibet consists of several regions. These include Amdo (A mdo) in the northeast, which is administratively part of the provinces of Qinghai, Gansu and Sichuan. Kham (Khams) in the southeast encompasses parts of western Sichuan, northern Yunnan, southern Qinghai and the eastern part of the Tibet Autonomous Region. Ü-Tsang (dBus gTsang) (Ü in the center, Tsang in the center-west, and Ngari (mNga' ris) in the far west) covered the central and western portion of Tibet Autonomous Region. 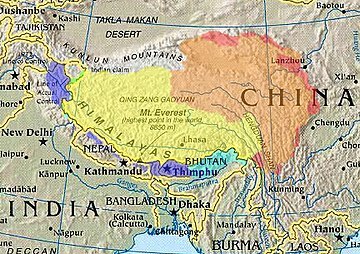 Tibetan cultural influences extend to the neighboring states of Bhutan, Nepal, regions of India such as Sikkim, Ladakh, Lahaul, and Spiti, Northern Pakistan Baltistan or Balti-yul in addition to designated Tibetan autonomous areas in adjacent Chinese provinces. There are over 800 settlements in Tibet. Lhasa is Tibet's traditional capital and the capital of Tibet Autonomous Region. 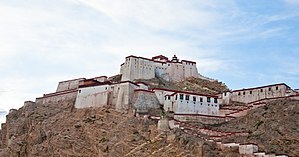 It contains two world heritage sites – the Potala Palace and Norbulingka, which were the residences of the Dalai Lama. Lhasa contains a number of significant temples and monasteries, including Jokhang and Ramoche Temple. Shigatse is the second largest city in the Tibet AR, west of Lhasa. Gyantse and Qamdo are also amongst the largest. 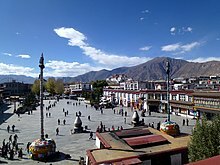 Other cities and towns in cultural Tibet include Shiquanhe (Ali), Nagchu, Bamda, Rutog, Nyingchi, Nedong, Coqên, Barkam, Sakya, Gartse, Pelbar, Lhatse, and Tingri; in Sichuan, Kangding (Dartsedo); in Qinghai, Jyekundo (Yushu), Machen, and Golmud; in India, Tawang, Leh, and Gangtok, and in Pakistan, Skardu, Kharmang, and Khaplu. The central region of Tibet is an autonomous region within China, the Tibet Autonomous Region. The Tibet Autonomous Region is a province-level entity of the People's Republic of China. It is governed by a People's Government, led by a Chairman. In practice, however, the Chairman is subordinate to the branch secretary of the Communist Party of China. As a matter of convention, the Chairman has almost always been an ethnic Tibetan, while the party secretary has always been ethnically non-Tibetan. The Tibetan economy is dominated by subsistence agriculture. 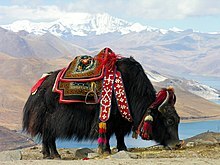 Due to limited arable land, the primary occupation of the Tibetan Plateau is raising livestock, such as sheep, cattle, goats, camels, yaks, dzo, and horses. The dogs of Tibet are twice the size of those seen in India, with large heads and hairy bodies. They are powerful animals, and are said to be able to kill a tiger. During the day they are kept chained up, and are let loose at night to guard their masters' house. The main crops grown are barley, wheat, buckwheat, rye, potatoes, and assorted fruits and vegetables. Tibet is ranked the lowest among China's 31 provinces on the Human Development Index according to UN Development Programme data. In recent years, due to increased interest in Tibetan Buddhism, tourism has become an increasingly important sector, and is actively promoted by the authorities. Tourism brings in the most income from the sale of handicrafts. 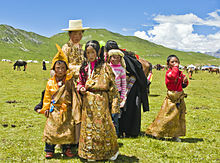 These include Tibetan hats, jewelry (silver and gold), wooden items, clothing, quilts, fabrics, Tibetan rugs and carpets. The Central People's Government exempts Tibet from all taxation and provides 90% of Tibet's government expenditures. However most of this investment goes to pay migrant workers who do not settle in Tibet and send much of their income home to other provinces. Pastoral nomads constitute about 40% of the ethnic Tibetan population. The Qingzang railway linking the Tibet Autonomous Region to Qinghai Province was opened in 2006, but not without controversy. In January 2007, the Chinese government issued a report outlining the discovery of a large mineral deposit under the Tibetan Plateau. The deposit has an estimated value of $128 billion and may double Chinese reserves of zinc, copper, and lead. The Chinese government sees this as a way to alleviate the nation's dependence on foreign mineral imports for its growing economy. However, critics worry that mining these vast resources will harm Tibet's fragile ecosystem and undermine Tibetan culture. On January 15, 2009, China announced the construction of Tibet's first expressway, a 37.9 km (23.5 mi) stretch of controlled-access highway in southwestern Lhasa. The project will cost 1.55 billion yuan (US$227 million). From January 18–20, 2010 a national conference on Tibet and areas inhabited by Tibetans in Sichuan, Yunnan, Gansu and Qinghai was held in China and a substantial plan to improve development of the areas was announced. The conference was attended by General secretary Hu Jintao, Wu Bangguo, Wen Jiabao, Jia Qinglin, Li Changchun, Xi Jinping, Li Keqiang, He Guoqiang and Zhou Yongkang, all members of CPC Politburo Standing Committee signaling the commitment of senior Chinese leaders to development of Tibet and ethnic Tibetan areas. The plan calls for improvement of rural Tibetan income to national standards by 2020 and free education for all rural Tibetan children. China has invested 310 billion yuan (about 45.6 billion U.S. dollars) in Tibet since 2001. "Tibet's GDP was expected to reach 43.7 billion yuan in 2009, up 170 percent from that in 2000 and posting an annual growth of 12.3 percent over the past nine years." The State Council approved Tibet Lhasa Economic and Technological Development Zone as a state-level development zone in 2001. It is located in the western suburbs of Lhasa, the capital of the Tibet Autonomous Region. It is 50 kilometres (31 miles) away from the Gonggar Airport, and 2 km (1.2 mi) away from Lhasa Railway Station and 2 km (1.2 mi) away from 318 national highway. The zone has a planned area of 5.46 km2 (2.11 sq mi) and is divided into two zones. Zone A developed a land area of 2.51 km2 (0.97 sq mi) for construction purposes. It is a flat zone, and has the natural conditions for good drainage. Historically, the population of Tibet consisted of primarily ethnic Tibetans and some other ethnic groups. According to tradition the original ancestors of the Tibetan people, as represented by the six red bands in the Tibetan flag, are: the Se, Mu, Dong, Tong, Dru and Ra. Other traditional ethnic groups with significant population or with the majority of the ethnic group residing in Tibet (excluding a disputed area with India) include Bai people, Blang, Bonan, Dongxiang, Han, Hui people, Lhoba, Lisu people, Miao, Mongols, Monguor (Tu people), Menba (Monpa), Mosuo, Nakhi, Qiang, Nu people, Pumi, Salar, and Yi people. The proportion of the non-Tibetan population in Tibet is disputed. On the one hand, the Central Tibetan Administration of the Dalai Lama accuses China of actively swamping Tibet with migrants in order to alter Tibet's demographic makeup. On the other hand, according to the 2010 Chinese census ethnic Tibetans comprise 90% of a total population of 3 million in the Tibet Autonomous Region. Exact population numbers probably depend on how temporary migrants are counted. Religion is extremely important to the Tibetans and has a strong influence over all aspects of their lives. Bön is the indigenous religion of Tibet, but has been almost eclipsed by Tibetan Buddhism, a distinctive form of Mahayana and Vajrayana, which was introduced into Tibet from the Sanskrit Buddhist tradition of northern India. Tibetan Buddhism is practiced not only in Tibet but also in Mongolia, parts of northern India, the Buryat Republic, the Tuva Republic, and in the Republic of Kalmykia and some other parts of China. During China's Cultural Revolution, nearly all Tibet's monasteries were ransacked and destroyed by the Red Guards. A few monasteries have begun to rebuild since the 1980s (with limited support from the Chinese government) and greater religious freedom has been granted – although it is still limited. Monks returned to monasteries across Tibet and monastic education resumed even though the number of monks imposed is strictly limited. Before the 1950s, between 10 and 20% of males in Tibet were monks. 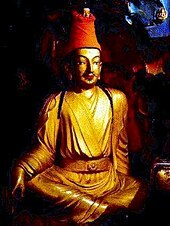 Gelug(pa), Way of Virtue, also known casually as Yellow Hat, whose spiritual head is the Ganden Tripa and whose temporal head is the Dalai Lama. Successive Dalai Lamas ruled Tibet from the mid-17th to mid-20th centuries. This order was founded in the 14th to 15th centuries by Je Tsongkhapa, based on the foundations of the Kadampa tradition. Tsongkhapa was renowned for both his scholasticism and his virtue. The Dalai Lama belongs to the Gelugpa school, and is regarded as the embodiment of the Bodhisattva of Compassion. Kagyu(pa), Oral Lineage. This contains one major subsect and one minor subsect. The first, the Dagpo Kagyu, encompasses those Kagyu schools that trace back to Gampopa. In turn, the Dagpo Kagyu consists of four major sub-sects: the Karma Kagyu, headed by a Karmapa, the Tsalpa Kagyu, the Barom Kagyu, and Pagtru Kagyu. The once-obscure Shangpa Kagyu, which was famously represented by the 20th-century teacher Kalu Rinpoche, traces its history back to the Indian master Niguma, sister of Kagyu lineage holder Naropa. This is an oral tradition which is very much concerned with the experiential dimension of meditation. Its most famous exponent was Milarepa, an 11th-century mystic. Nyingma(pa), The Ancient Ones. This is the oldest, the original order founded by Padmasambhava. Sakya(pa), Grey Earth, headed by the Sakya Trizin, founded by Khon Konchog Gyalpo, a disciple of the great translator Drokmi Lotsawa. Sakya Pandita 1182–1251 CE was the great grandson of Khon Konchog Gyalpo. This school emphasizes scholarship. Jonang(pa) Its origins in Tibet can be traced to early 12th century master Yumo Mikyo Dorje, but became much wider known with the help of Dolpopa Sherab Gyaltsen, a monk originally trained in the Sakya school. The Jonang school was widely thought to have become extinct in the late 17th century at the hands of the 5th Dalai Lama, who forcibly annexed the Jonang monasteries to his Gelug school, declaring them heretical. Thus, Tibetologists were astonished when fieldwork turned up several active Jonangpa monasteries, including the main monastery, Tsangwa, located in Zamtang County, Sichuan. Almost 40 monasteries, comprising about 5000 monks, have subsequently been found, including some in the Amdo Tibetan and rGyalgrong areas of Qinghai, Sichuan and Tibet. One of the primary supporters of the Jonang lineage in exile has been the 14th Dalai Lama of the Gelugpa lineage. The Jonang tradition has recently officially registered with the Tibetan Government in exile to be recognized as the fifth living Buddhist tradition of Tibetan Buddhism. The 14th Dalai Lama assigned Jebtsundamba Khutuktu of Mongolia (who is considered to be an incarnation of Taranatha) as the leader of the Jonang tradition. The first Christians documented to have reached Tibet were the Nestorians, of whom various remains and inscriptions have been found in Tibet. They were also present at the imperial camp of Möngke Khan at Shira Ordo, where they debated in 1256 with Karma Pakshi (1204/6-83), head of the Karma Kagyu order. Desideri, who reached Lhasa in 1716, encountered Armenian and Russian merchants. Roman Catholic Jesuits and Capuchins arrived from Europe in the 17th and 18th centuries. Portuguese missionaries Jesuit Father António de Andrade and Brother Manuel Marques first reached the kingdom of Gelu in western Tibet in 1624 and was welcomed by the royal family who allowed them to build a church later on. By 1627, there were about a hundred local converts in the Guge kingdom. 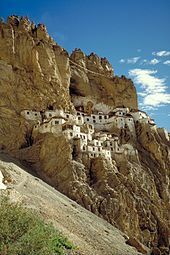 Later on, Christianity was introduced to Rudok, Ladakh and Tsang and was welcomed by the ruler of the Tsang kingdom, where Andrade and his fellows established a Jesuit outpost at Shigatse in 1626. In 1661 another Jesuit, Johann Grueber, crossed Tibet from Sining to Lhasa (where he spent a month), before heading on to Nepal. He was followed by others who actually built a church in Lhasa. These included the Jesuit Father Ippolito Desideri, 1716–1721, who gained a deep knowledge of Tibetan culture, language and Buddhism, and various Capuchins in 1707–1711, 1716–1733 and 1741–1745, Christianity was used by some Tibetan monarchs and their courts and the Karmapa sect lamas to counterbalance the influence of the Gelugpa sect in the 17th century until in 1745 when all the missionaries were expelled at the lama's insistence. In 1877, the Protestant James Cameron from the China Inland Mission walked from Chongqing to Batang in Garzê Tibetan Autonomous Prefecture, Sichuan province, and "brought the Gospel to the Tibetan people." Beginning in the 20th century, in Diqing Tibetan Autonomous Prefecture in Yunnan, a large number of Lisu people and some Yi and Nu people converted to Christianity. Famous earlier missionaries include James O. Fraser, Alfred James Broomhall and Isobel Kuhn of the China Inland Mission, among others who were active in this area. Proselytising has been illegal in China since 1949. But as of 2013[update], many Christian missionaries were reported to be active in Tibet with the tacit approval of Chinese authorities, who view the missionaries as a counterforce to Tibetan Buddhism or as a boon to the local economy. Muslims have been living in Tibet since as early as the 8th or 9th century. In Tibetan cities, there are small communities of Muslims, known as Kachee (Kache), who trace their origin to immigrants from three main regions: Kashmir (Kachee Yul in ancient Tibetan), Ladakh and the Central Asian Turkic countries. Islamic influence in Tibet also came from Persia. A Muslim Sufi Syed Ali Hamdani preached to the people of Baltistan, then known as little Tibet. Which became main cause of the cultural separation of the people of Baltistan from the mainstream Tibet . After 1959 a group of Tibetan Muslims made a case for Indian nationality based on their historic roots to Kashmir and the Indian government declared all Tibetan Muslims Indian citizens later on that year. Other Muslim ethnic groups who have long inhabited Tibet include Hui, Salar, Dongxiang and Bonan. There is also a well established Chinese Muslim community (gya kachee), which traces its ancestry back to the Hui ethnic group of China. Tibetan representations of art are intrinsically bound with Tibetan Buddhism and commonly depict deities or variations of Buddha in various forms from bronze Buddhist statues and shrines, to highly colorful thangka paintings and mandalas. Tibetan architecture contains Chinese and Indian influences, and reflects a deeply Buddhist approach. The Buddhist wheel, along with two dragons, can be seen on nearly every Gompa in Tibet. The design of the Tibetan Chörtens can vary, from roundish walls in Kham to squarish, four-sided walls in Ladakh. The most distinctive feature of Tibetan architecture is that many of the houses and monasteries are built on elevated, sunny sites facing the south, and are often made out of a mixture of rocks, wood, cement and earth. Little fuel is available for heat or lighting, so flat roofs are built to conserve heat, and multiple windows are constructed to let in sunlight. Walls are usually sloped inwards at 10 degrees as a precaution against the frequent earthquakes in this mountainous area. 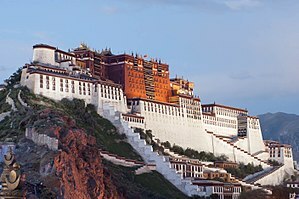 Standing at 117 metres (384 feet) in height and 360 metres (1,180 feet) in width, the Potala Palace is the most important example of Tibetan architecture. Formerly the residence of the Dalai Lama, it contains over one thousand rooms within thirteen stories, and houses portraits of the past Dalai Lamas and statues of the Buddha. 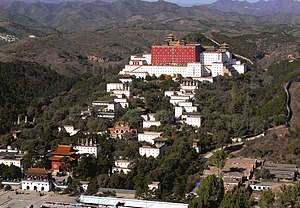 It is divided between the outer White Palace, which serves as the administrative quarters, and the inner Red Quarters, which houses the assembly hall of the Lamas, chapels, 10,000 shrines, and a vast library of Buddhist scriptures. The Potala Palace is a World Heritage Site, as is Norbulingka, the former summer residence of the Dalai Lama. The music of Tibet reflects the cultural heritage of the trans-Himalayan region, centered in Tibet but also known wherever ethnic Tibetan groups are found in India, Bhutan, Nepal and further abroad. First and foremost Tibetan music is religious music, reflecting the profound influence of Tibetan Buddhism on the culture. Tibetan music often involves chanting in Tibetan or Sanskrit, as an integral part of the religion. These chants are complex, often recitations of sacred texts or in celebration of various festivals. Yang chanting, performed without metrical timing, is accompanied by resonant drums and low, sustained syllables. Other styles include those unique to the various schools of Tibetan Buddhism, such as the classical music of the popular Gelugpa school, and the romantic music of the Nyingmapa, Sakyapa and Kagyupa schools. Nangma dance music is especially popular in the karaoke bars of the urban center of Tibet, Lhasa. Another form of popular music is the classical gar style, which is performed at rituals and ceremonies. Lu are a type of songs that feature glottal vibrations and high pitches. There are also epic bards who sing of Gesar, who is a hero to ethnic Tibetans. Tibet has various festivals that are commonly performed to worship the Buddha throughout the year. Losar is the Tibetan New Year Festival. Preparations for the festive event are manifested by special offerings to family shrine deities, painted doors with religious symbols, and other painstaking jobs done to prepare for the event. Tibetans eat Guthuk (barley noodle soup with filling) on New Year's Eve with their families. 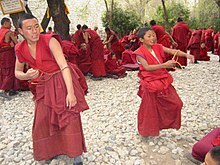 The Monlam Prayer Festival follows it in the first month of the Tibetan calendar, falling between the fourth and the eleventh days of the first Tibetan month. It involves dancing and participating in sports events, as well as sharing picnics. The event was established in 1049 by Tsong Khapa, the founder of the Dalai Lama and the Panchen Lama's order. The most important crop in Tibet is barley, and dough made from barley flour—called tsampa—is the staple food of Tibet. This is either rolled into noodles or made into steamed dumplings called momos. Meat dishes are likely to be yak, goat, or mutton, often dried, or cooked into a spicy stew with potatoes. Mustard seed is cultivated in Tibet, and therefore features heavily in its cuisine. Yak yogurt, butter and cheese are frequently eaten, and well-prepared yogurt is considered something of a prestige item. Butter tea is very popular to drink. ^ Wittke, J.H. (February 24, 2010). 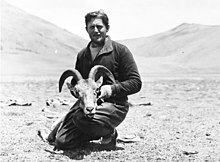 "Geology of the Tibetan Plateau". Retrieved March 29, 2019. ^ Ram, N (September 2, 2000). "TIBET - A REALITY CHECK" (18). Frontline. Archived from the original on September 15, 2017. Retrieved September 15, 2017. ^ "Q&A: China and the Tibetans". BBC News. August 15, 2011. Archived from the original on July 16, 2018. Retrieved May 17, 2017. ^ "Regions and territories: Tibet". BBC News. December 11, 2010. Archived from the original on April 22, 2011. Retrieved April 22, 2011. ^ Wong, Edward (February 18, 2009). "China Adds to Security Forces in Tibet Amid Calls for a Boycott". The New York Times. ISSN 0362-4331. Archived from the original on June 16, 2017. Retrieved May 17, 2017. ^ "Bon". ReligionFacts. Archived from the original on May 9, 2017. Retrieved May 17, 2017. ^ Étienne de la Vaissière, "The Triple System of Orography in Ptolemy's Xinjiang", Exegisti Monumenta: Festschrif in Honour of Nicholas Sims-Williams, eds. Werner Sundermann, Almut Hintze & François de Blois (Wiesbaden, Germany: Harrassowitz, 2009), 532. ^ Baxter, William H. (March 30, 2001). "An Etymological Dictionary of Common Chinese Characters". Archived from the original on April 11, 2011. Retrieved April 16, 2011. ^ Dr. Elliot Sperling. "Tubote, Tibet, and the Power of Naming". Tibetan Political Review. Archived from the original on March 28, 2016. Retrieved July 31, 2018. ^ Essay towards a Dictionary, Tibetan and English. Prepared, with assistance of Bandé Sangs-rgyas Phuntshogs ... by Alexander Csoma de Kőrös, etc., Calcutta: Baptist Mission Press, 1834. ^ Jain, Arun Kumar (2009). Faith & Philosophy of Jainism. ISBN 9788178357232. ^ a b Zhao, M; Kong, QP; Wang, HW; Peng, MS; Xie, XD; Wang, WZ; Jiayang, Duan JG; Cai, MC; Zhao, SN; Cidanpingcuo, Tu YQ; Wu, SF; Yao, YG; Bandelt, HJ; Zhang, YP (2009). "Mitochondrial genome evidence reveals successful Late Paleolithic settlement on the Tibetan Plateau". Proc Natl Acad Sci U S A. 106 (50): 21230–21235. Bibcode:2009PNAS..10621230Z. doi:10.1073/pnas.0907844106. PMC 2795552. PMID 19955425. ^ Marks, Thomas A. (1978). "Nanchao and Tibet in South-western China and Central Asia." The Tibet Journal. Vol. 3, No. 4. Winter 1978, pp. 13–16. ^ 'A Corpus of Early Tibetan Inscriptions. H. E. Richardson. Royal Asiatic Society (1985), pp. 106–43. ISBN 0-947593-00-4. ^ a b c Dawa Norbu. China's Tibet Policy, pp. 139. Psychology Press. ^ Wang Jiawei, "The Historical Status of China's Tibet", 2000, pp. 162–6. ^ The Sino-Indian Border Disputes, by Alfred P. Rubin, The International and Comparative Law Quarterly, Vol. 9, No. 1. (Jan., 1960), pp. 96–125. ^ Brunnert, H. S. and Hagelstrom, V. V. _Present Day Political Organization of China_, Shanghai, 1912. p. 467. ^ Stas Bekman: stas (at) stason.org. 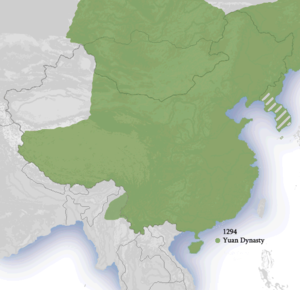 "What was Tibet's status during China's Qing dynasty (1644–1912)?". Stason.org. Archived from the original on April 7, 2008. Retrieved August 26, 2012. ^ Interview: British invasions probed as root cause of Tibetan separatism_English_Xinhua Archived July 16, 2012, at the Wayback Machine. News.xinhuanet.com (2008-04-06). Retrieved on 2013-07-18. ^ The British invasion of Tibet. Archived September 9, 2015, at the Wayback Machine Retrieved on 2018-09-05. ^ Mayhew, Bradley and Michael Kohn. (2005). Tibet, p. 32. Lonely Planet Publications. ISBN 1-74059-523-8. ^ Wang Jiawei, "The Historical Status of China's Tibet", 2000, p. 150. ^ Neville Maxwell (February 12, 2011). "The Pre-history of the Sino-Indian Border Dispute: A Note". Mainstream Weekly. Archived from the original on January 19, 2012. Retrieved October 15, 2011. ^ a b Calvin, James Barnard (April 1984). "The China-India Border War". Marine Corps Command and Staff College. Archived from the original on November 11, 2011. Retrieved October 15, 2011. ^ Isabel Hilton (2001). The Search for the Panchen Lama. W. W. Norton & Company. p. 112. ISBN 978-0-393-32167-8. Retrieved June 28, 2010. ^ Rossabi, Morris (2005). "An Overview of Sino-Tibetan Relations". Governing China's Multiethnic Frontiers. University of Washington Press. p. 197. ^ "World Directory of Minorities and Indigenous Peoples – China : Tibetans". Minority Rights Group International. July 2008. Archived from the original on November 1, 2014. Retrieved April 23, 2014. ^ Boyle, Kevin; Sheen, Juliet (2003). Freedom of religion and belief: a world report. Routledge. ISBN 978-0415159777. ^ a b Bank, David; Leyden, Peter (January 1990). "As Tibet Goes...". 15 (1). Mother Jones. ISSN 0362-8841. ^ "plateaus". Archived from the original on April 1, 2009. Retrieved May 16, 2009. ^ Amante, C. and B.W. Eakins, 2009. ETOPO1 1 Arc-Minute Global Relief Model: Procedures, Data Sources and Analysis. NOAA Technical Memorandum NESDIS NGDC-24. National Geophysical Data Center, NOAA Archived June 26, 2015, at the Wayback Machine. doi:10.7289/V5C8276M [access date: 2015-03-18]. ^ "Circle of Blue, 8 May 2008 China, Tibet, and the strategic power of water". Circleofblue.org. May 8, 2008. Archived from the original on July 2, 2008. Retrieved March 26, 2010. ^ "The Water Tower Function of the Tibetan Autonomous Region". Futurewater.nl. Archived from the original on April 25, 2012. Retrieved August 26, 2012. ^ "China to spend record amount on Tibetan water projects". English.people.com.cn. August 16, 2011. Archived from the original on December 27, 2011. Retrieved August 26, 2012. ^ "Leadership shake-up in China's Tibet: state media". France: France 24. Agence France-Presse. January 15, 2010. Archived from the original on January 18, 2010. Retrieved July 29, 2010. ^ Travels in Central Asia by Meer Izzut-oollah in the Years 1812–13. Translated by Captain Henderson. Calcutta, 1872, p. 15. ^ Tsering, Tashi. "Globalization To Tibet" (PDF). Tibet Justice Center. p. 9. Archived (PDF) from the original on March 20, 2012. Retrieved July 10, 2013. ^ "Tibet Environmental Watch – Development". Tew.org. Archived from the original on June 8, 2011. Retrieved March 26, 2010. ^ "China TIBET Tourism Bureau". Archived from the original on August 31, 2009. Retrieved March 7, 2009. 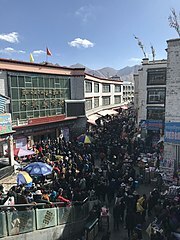 ^ "Tibet's economy depends on Beijing". NPR News. August 26, 2002. Archived from the original on December 26, 2017. Retrieved February 24, 2006. ^ Brown, Kerry (January 11, 2014). "How Xi Can Solve The Tibet Problem". thediplomat.com. The Diplomat. Archived from the original on January 11, 2014. Retrieved January 10, 2014. ^ Daniel Winkler (November 2008). "Yartsa Gunbu (Cordyceps sinensis) and the Fungal Commodification of Tibet's Rural Economy". Economic Botany. 62 (3): 291–305. doi:10.1007/s12231-008-9038-3. ^ "China opens world's highest railway". Australian Broadcasting Corporation. July 1, 2005. Archived from the original on July 6, 2006. Retrieved July 1, 2006. ^ "China completes railway to Tibet". BBC News. October 15, 2005. Archived from the original on August 23, 2006. Retrieved July 4, 2006. ^ "Dalai Lama Urges 'Wait And See' On Tibet Railway". Deutsche Presse Agentur. June 30, 2006. Archived from the original on May 22, 2016. Retrieved July 4, 2006. ^ a b "Valuable mineral deposits found along Tibet railroad route". New York Times. January 25, 2007. Archived from the original on July 24, 2016. Retrieved January 6, 2014. ^ Peng, James (January 16, 2009). "China Says 'Sabotage' by Dalai Lama Supporters Set Back Tibet". Archived from the original on October 14, 2007. Retrieved February 7, 2009. ^ "Lhasa Economic & Technology Development Zone". RightSite.asia. Archived from the original on July 6, 2011. Retrieved December 31, 2010. ^ "Population Transfer Programmes". Central Tibetan Administration. 2003. Archived from the original on July 30, 2010. Retrieved July 29, 2010. ^ "Tibet's population tops 3 million; 90% are Tibetans". Xinhua News Agency. May 4, 2011. Archived from the original on May 13, 2011. Retrieved December 4, 2011. ^ Conze, Edward (1993). A Short History of Buddhism. Oneworld. ISBN 978-1-85168-066-5. ^ a b Tibetan monks: A controlled life Archived February 18, 2009, at the Wayback Machine. BBC News. March 20, 2008. ^ Tibet During the Cultural Revolution Pictures from a Tibetan People's Liberation Army's officer Archived copy at the Library of Congress (May 5, 2010). ^ TIBET'S BUDDHIST MONKS ENDURE TO REBUILD A PART OF THE PAST New York Times Published: June 14, 1987. ^ Goldstein, Melvyn C. (2007). A History of Modern Tibet: Volume 2 The Calm before the Storm, 1951–1955. Berkeley, CA: University of California Press. ^ Graham Sanderg, The Exploration of Tibet: History and Particulars (Delhi: Cosmo Publications, 1973), pp. 23–26; Thomas Holdich, Tibet, The Mysterious (London: Alston Rivers, 1906), p. 70. ^ Sir Edward Maclagan, The Jesuits and The Great Mogul (London: Burns, Oates & Washbourne Ltd., 1932), pp. 344–345. ^ Lettera del P. Alano Dos Anjos al Provinciale di Goa, 10 Novembre 1627, quoted from Wu Kunming, Zaoqi Chuanjiaoshi jin Zang Huodongshi (Beijing: Zhongguo Zangxue chubanshe, 1992), p. 163. ^ Extensively using Italian and Portuguese archival materials, Wu's work gives a detailed account of Cacella's activities in Tsang. See Zaoqi Chuanjiaoshi jin Zang Huodongshi, esp. chapter 5. ^ Narratives of the Mission of George Bogle to Tibet, and of the Journey of Thomas Manning to Lhasa, pp. 295–302. Clements R. Markham. (1876). Reprint Cosmo Publications, New Delhi. 1989. ^ "When Christianity and Lamaism Met: The Changing Fortunes of Early Western Missionaries in Tibet by Lin Hsiao-ting of Stanford University". Pacificrim.usfca.edu. Archived from the original on June 26, 2010. Retrieved March 26, 2010. ^ "BBC News Country Profiles Timeline: Tibet". November 5, 2009. Archived from the original on March 11, 2009. Retrieved March 11, 2009. ^ Lettera del P. Antonio de Andrade. Giovanni de Oliveira. Alano Dos Anjos al Provinciale di Goa, 29 Agosto, 1627, quoted from Wu, Zaoqi Chuanjiaoshi jin Zang Huodongshi, p. 196; Maclagan, The Jesuits and The Great Mogul, pp. 347–348. ^ Cornelius Wessels, Early Jesuit Travellers in Central Asia, 1603–1721 (The Hague: Nijhoff, 1924), pp. 80–85. ^ Maclagan, The Jesuits and The Great Mogul, pp. 349–352; Filippo De Filippi ed., An Account of Tibet, pp. 13–17. ^ Relação da Missão do Reino de Uçangue Cabeça dos do Potente, Escrita pello P. João Cabral da Comp. de Jesu. fol. 1, quoted from Wu, Zaoqi Chuanjiaoshi jin Zang Huodongshi, pp. 294–297; Wang Yonghong, "Luelun Tianzhujiao zai Xizang di Zaoqi Huodong", Xizang Yanjiu, 1989, No. 3, pp. 62–63. ^ "Yunnan Province of China Government Web". Archived from the original on March 12, 2009. Retrieved February 15, 2008. ^ Kaiman, Jonathan (February 21, 2013). "Going undercover, the evangelists taking Jesus to Tibet". The Guardian. Archived from the original on August 26, 2013. Retrieved February 21, 2013. ^ Crossley-Holland, Peter. (1976). "The Ritual Music of Tibet." The Tibet Journal. Vol. 1, Nos. 3 & 4, Autumn 1976, pp. 47–53. Allen, Charles (2004). Duel in the Snows: The True Story of the Younghusband Mission to Lhasa. London: John Murray. ISBN 0-7195-5427-6. Bell, Charles (1924). Tibet: Past & Present. Oxford: Clarendon Press. Dowman, Keith (1988). The Power-Places of Central Tibet: The Pilgrim's Guide. Routledge & Kegan Paul. London, ISBN 0-7102-1370-0. New York, ISBN 0-14-019118-6. McKay, Alex (1997). Tibet and the British Raj: The Frontier Cadre 1904–1947. London: Curzon. ISBN 0-7007-0627-5. Norbu, Thubten Jigme; Turnbull, Colin (1968). Tibet: Its History, Religion and People. Reprint: Penguin Books (1987). Pachen, Ani; Donnely, Adelaide (2000). Sorrow Mountain: The Journey of a Tibetan Warrior Nun. Kodansha America, Inc. ISBN 1-56836-294-3. Petech, Luciano (1997). China and Tibet in the Early XVIIIth Century: History of the Establishment of Chinese Protectorate in Tibet. T'oung Pao Monographies, Brill Academic Publishers, ISBN 90-04-03442-0. Rabgey, Tashi; Sharlho, Tseten Wangchuk (2004). Sino-Tibetan Dialogue in the Post-Mao Era: Lessons and Prospects (PDF). Washington: East-West Center. ISBN 978-1-932728-22-4. Samuel, Geoffrey (1993). Civilized Shamans: Buddhism in Tibetan Societies. Smithsonian ISBN 1-56098-231-4. Schell, Orville (2000). Virtual Tibet: Searching for Shangri-La from the Himalayas to Hollywood. Henry Holt. ISBN 0-8050-4381-0. Smith, Warren W. (1996). History of Tibet: Nationalism and Self-determination. Boulder, CO: Westview Press. ISBN 978-0-8133-3155-3. Smith, Warren W. (2004). China's Policy on Tibetan Autonomy – EWC Working Papers No. 2 (PDF). Washington: East-West Center. Thurman, Robert (2002). Robert Thurman on Tibet. DVD. ASIN B00005Y722. Van Walt van Praag, Michael C. (1987). The Status of Tibet: History, Rights, and Prospects in International Law. Boulder, Colorado: Westview Press. Wilby, Sorrel (1988). Journey Across Tibet: A Young Woman's 1,900-mile (3,060 km) Trek Across the Rooftop of the World. Contemporary Books. ISBN 0-8092-4608-2. Wang Jiawei (2000). The Historical Status of China's Tibet. ISBN 7-80113-304-8. Zenz, Adrian (2014). Tibetanness under Threat? Neo-Integrationism, Minority Education and Career Strategies in Qinghai, P.R. China. Global Oriental. ISBN 9789004257962.